Accelerating FinTech development by connecting innovative industry leaders and fostering discussion and collaboration. <HONG KONG, January 17, 2018> — Monaco, the pioneering payments and cryptocurrency platform, today announced that it will be a lead (5 Star) sponsor of the inaugural Money20/20 Asia event — the leading global Payments and FinTech event — that will take place in Singapore at the Marina Bay Sands Expo & Convention Centre from March 13–15, 2018. Monaco looks forward to gathering and connecting industry leaders and innovative companies in APAC and will be hosting a drinks reception for all speakers and sponsors on Monday, March 12 at The Fullerton Bay Hotel rooftop. Monaco will also sponsor the Sweet Spot Café located in the registration area on Level 3 and all the event’s networking breaks on Level 4. Monaco announced in October 2017 that its Monaco Visa card program received approval from its card issuer and will first be launched in Singapore. As of now, Monaco has received more than 55,000 card reservations. With the Monaco app, users will be able to buy and exchange fiat and cryptocurrencies including bitcoin, ethereum and Monaco’s MCO token. Monaco Visa cards work anywhere Visa is accepted, allowing users to spend legal tender currency converted from cryptocurrency without currency exchange fees. 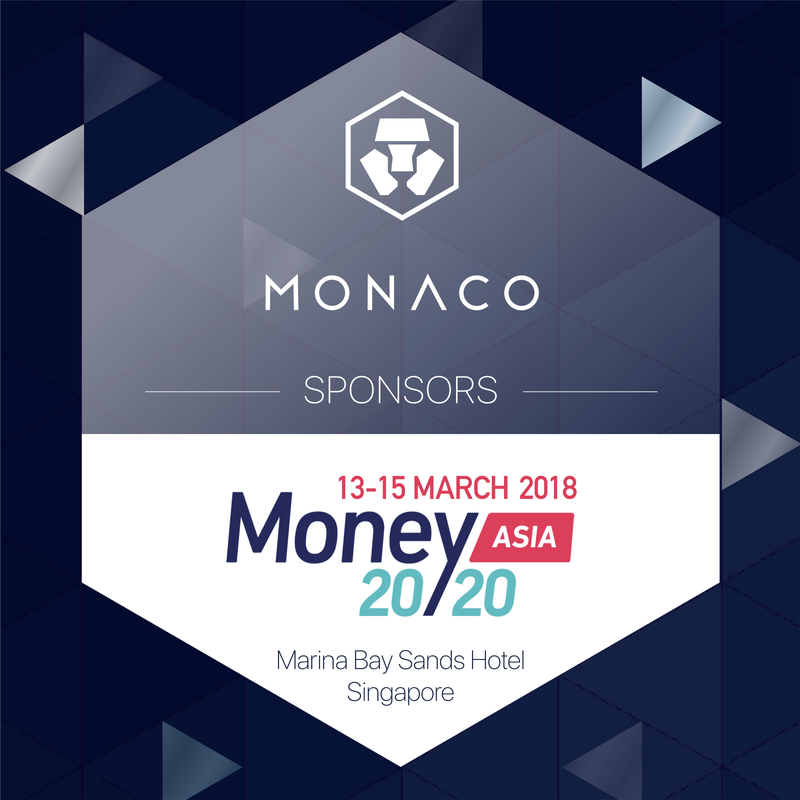 Participants are invited to stop by Monaco’s booth at Money20/20 Asia located at Marina Bay Sands Expo & Convention Centre Hall Level 5, to learn more about the Monaco Visa card and app. Monaco Technology GmbH with a vision of Cryptocurrency in Every Wallet™ is the pioneering payments and cryptocurrency platform. The Monaco Visa card and mobile app allow users to buy, exchange, and spend fiat and cryptocurrencies, such as bitcoin and ethereum, at perfect interbank exchange rates. Founded in June 2016, Monaco raised US$26.7 million through one of the most successful Token Sale events to date. The company is headquartered in Switzerland with offices in Hong Kong and Singapore.